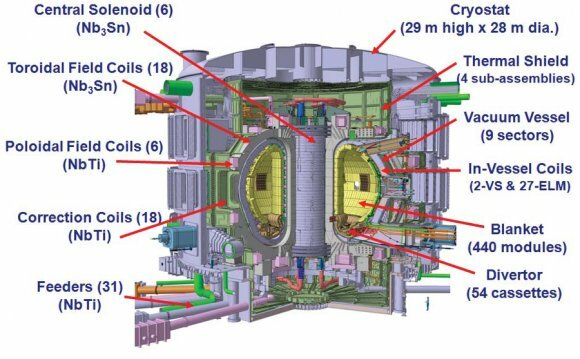 The ITER experiments will take place inside the vacuum vessel, a hermetically-sealed steel container that houses the fusion reaction and acts as a first safety containment barrier. In its doughnut-shaped chamber, or torus, the plasma particles spiral around continuously without touching the walls. The vacuum vessel provides a high-vacuum environment for the plasma, improves radiation shielding and plasma stability, acts as the primary confinement barrier for radioactivity, and provides support for in-vessel components such as the blanket and the divertor. Cooling water circulating through the vessel's double steel walls will remove the heat generated during operation. The blanket modules lining the inner surfaces of the vessel will provide shielding from the high-energy neutrons produced by the fusion reactions. (Some blanket modules will also be used at later stages to test materials for tritium breeding concepts.) Along with the magnet systems, the ITER vacuum vessel is entirely enclosed in a large vacuum chamber called the cryostat. In a tokamak device, the larger the vacuum chamber volume, the easier it is to confine the plasma and achieve the type of high energy regime that will produce significant fusion power. In-Wall Shielding Approximately 55 percent of the space between the double walls of the vacuum vessel will be occupied by in-wall shielding in the form of modular blocks, weighing up to 500 kg each. Made of borated and ferromagnetic stainless steel, the blocks will provide shielding from neutron radiation for components situated outside of the vacuum vessel (such as the magnets) and contribute to plasma performance by limiting a type of perturbation known as toroidal field ripple. Two-thirds of the vacuum vessel's 9, 000 in-wall shielding blocks will be set into place during vacuum vessel sector fabrication; others will be delivered to the ITER construction site for installation during assembly. Thermal shielding Two layers of thermal shielding are interposed between the vacuum vessel and the cryostat to minimize heat loads transferred by thermal radiation and conduction from warm components to the components and structures that operate at 4.5K (such as the magnets). Reduction of these heat loads by over two orders of magnitude is compulsory to ensure that the residual heat load can be removed by the ITER cryoplant with reasonable capacity.